These cookies were a huge hit at Thanksgiving—so much so that I am making them again for Xmas. And I also promised to get them on the blog real soon. So—voila. I worked extra hard on these—I made them several times (I know, tough job! ), adapting from at least four different pumpkin spice cookie recipes, trying different combinations of flour types and quantities till I got the taste and texture I wanted. They’re extremely low-sugar, as are all my recipes—so as always, you can up the sugar either by adding more granulated (and adding more moisture to balance that by splashing in some more nut milk) or by adding some maple syrup or molasses. 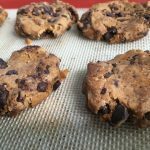 I tried one batch with dried unsweetened cranberries as well, and they were yummy! (And that red might add a nice Xmas touch!) But unsweetened cranberries are hard to find, and in the end I wanted to share them as basic pumpkin chocolate chip. 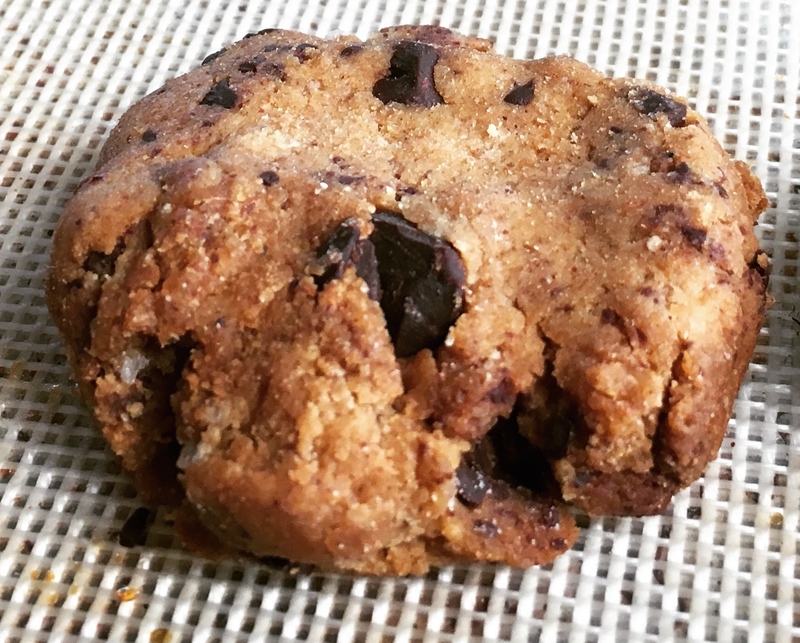 I honestly feel like these are as good a healthy energy snack as they are a holiday cookie! Enjoy! Mix the wet ingredients together in a large bowl until they’re smoothly blended. I start with the pumpkin, add the coconut oil, then vanilla, then mix in the sugar, and finally the hot tea. As I often do with my baking, I keep things simple by using one bowl, so you can add the dry ingredient in a well in the center, sifting them first in the well and then mixing them outward until you have what feels like a dough. Chop the chocolate bar in a food processor or blender (I used Endangered Species 88% dark, but you can use anything you like, or 3/4-1 cup dark chocolate chips). I chop them roughly until the chunks are larger than chocolate chips but not much larger than an adult fingernail. 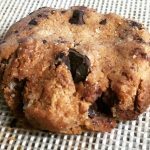 Fold in the chocolate chunks or chips, and add a splash of almond or coconut milk to moisten a bit if the dough is crumbly. 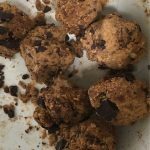 Form dough into balls (I made my cookies fairly small—bite-size for sharing and giving and buffet—but you could divide this recipe up any way you like, making fewer medium or large cookies. 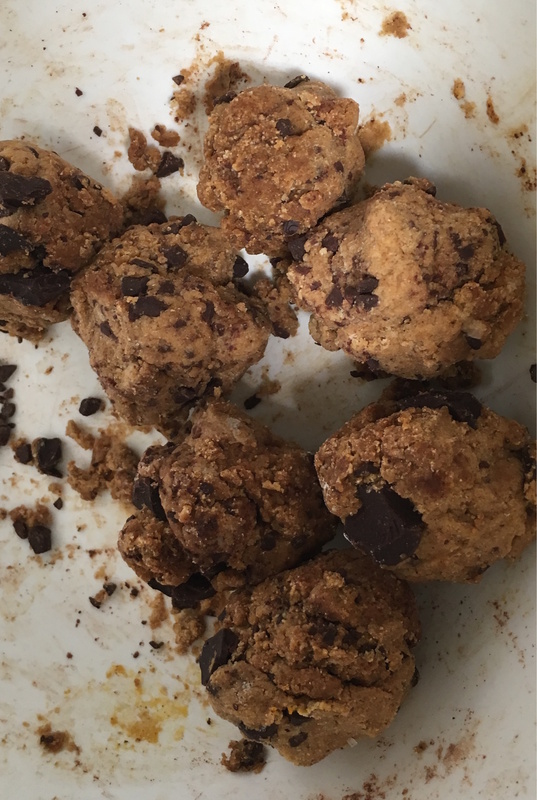 By making balls the size of chocolate truffles, I got 27 cookies (I know, a weird number) out of this recipe). Obviously, double recipe for more. Place the balls on a silicone baking mat (my pref) or stainless pan lined with parchment (I don’t recommend nonstick bakeware). Flatten the balls into a cookie shape with a large spoon or your palm. Bake at 375˚ for 13-18 minutes depending on your oven; check often. If cookies have brown edges or are springy when poked in center, it’s time for them to come out! 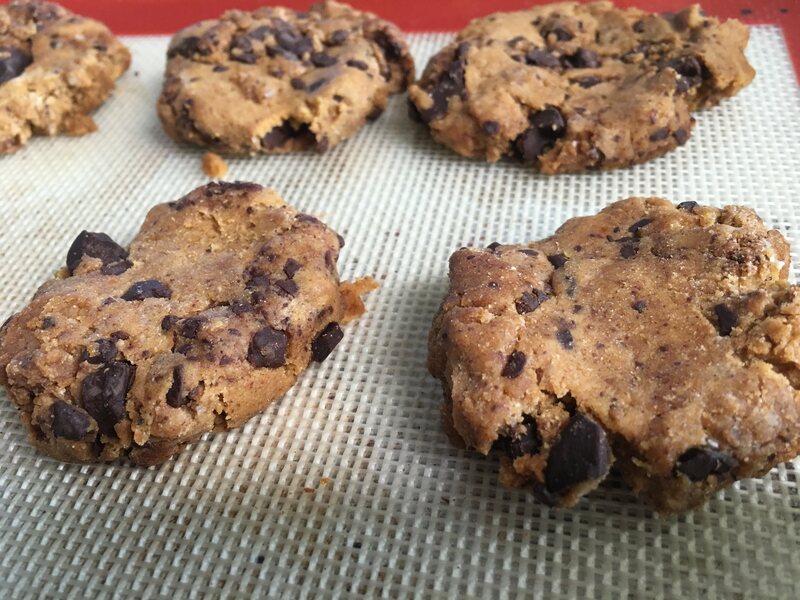 You could bake a couple minutes longer for a drier, crisper cookie.